I’m beginning to feel like one very lazy walker. The last few walks have been very pleasant affairs, nice and short and easy, with no real WORK. And nothing could be even lazier or easier than Snow Hill and Mount Morriston. Don’t get me wrong though, I’ve thoroughly enjoyed the socialising possible on these kind of walks, where you can fan out across nice wide 4wd tracks, and there’s no real rush to make a certain time. In fact, I think I’ve enjoyed it so much that walking’s become a bit different for me now. Not sure how to put it into words though just yet, but a poor attempt at part of it would be to say it’s no longer about me trying to conquer mountains, which is perhaps an attempt to conquer the doubter in me, but rather to explore what they have to offer, what they have to teach. And while that is a very personal affair, it doesn’t have to be done solo, but rather if you walk with the right kind of people, you have more than enough space and time to form a relationship with each mountain you climb. Anyway, the story behind these two little peaks started with the Mt Mueller trip that I’d planned for last Sunday. Snow, rain and wind saw its postponement, and I had thought of doing it instead by myself on the Monday (5 August), as I had to hand the key back on the Tuesday. But again the weather forecast was less than favourable, and while it’s one thing to go out and get wet and cold and snowed on with friends, it’s a tad more lonely, tad more cold, and a fair bit less fun when you’re alone. So, trusting the forecasters, who had predicted rain in every one of the towns you can click on on the BOM website, I figured a drive would be favourable. So Snow Hill and Mount Morriston it was. I was lucky enough to have a friend ask to come along, even though she’d done both peaks before, and even luckier still, she had a rough idea of what the roads had looked like. 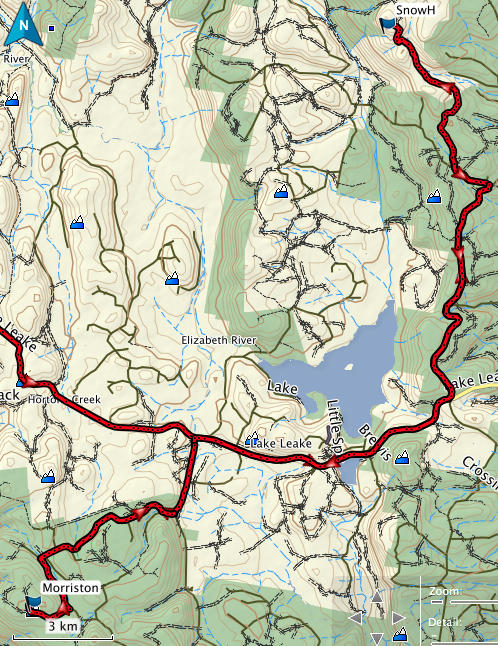 So we drove up to Campbell Town, turning right into the Lake Leake road. We followed this along, driving by the Mt Morriston turn off to the right, heading first for Snow Hill. The turn off is at a crossroads, and you head left (see GPS route). With me giving directions from the GPS, and her keeping the revs up on her little 2wd at the same time as avoiding the larger of the rocks and the soft patches in the road, we managed to take all the right turns, and parked in a clearing by the yellow boom gate. 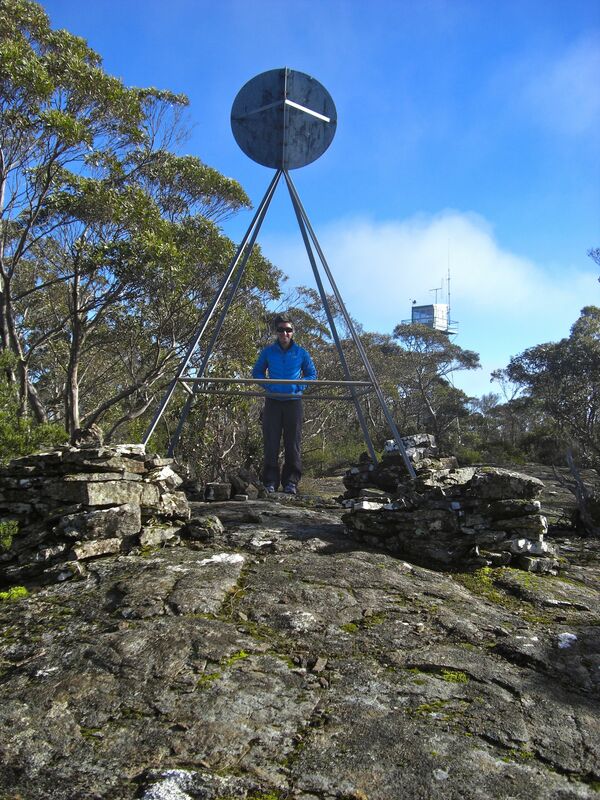 A couple of hundred metres walk (less than 5 minutes), and we were standing on the Trig point. Just to be sure we were at the highest point, and to get a bit of the view, we climbed as far as you can climb up the fire tower. The view out east to the Hazards wasn’t too bad. Neither was the 2 points you get, though I think you earn those points on the drive. And back down we went, much happier once we were past some of the softish spots on the road, one in particular. And so we headed back along the Lake Leake road, turning left this time to take the dirt, then gravel, roads to Mt Morriston. My Google Earth ‘direct route’ proved to be the right one again, and, despite nearly missing the last turn off, we were there relatively quickly and easily – the roads were in better condition than those up Snow Hill, though perhaps less travelled? 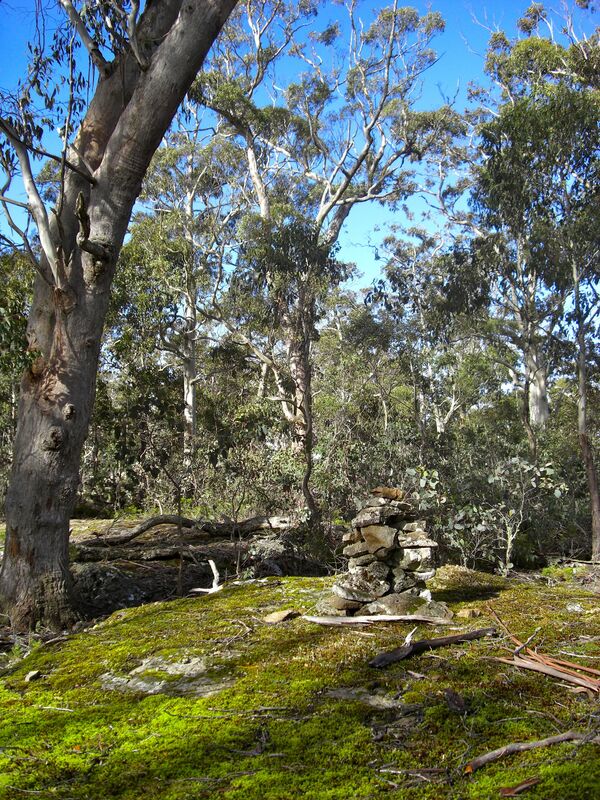 You park about 200 metres from the summit, and it’s nice and green and mossy. A lovely spot for lunch I reckon. It takes very little to walk over, and all of a sudden the summit cairn appears and it’s like “oh, that’s it!”. I’d recommend this one for anyone wanting to break up a drive, or with a few extra hours on their hands on the way back from a walk up north. Easy, but quite nice on top, even without a view. All up: Snow Hill: 17 mins, 982m, 47m ascent; Morriston: 7 mins, 370m, 9 m ascent.